The mountain was a dry, endless pile of rocks tufted with yellow grass and dying shrubs. I reached a flat area and was grateful for the respite. After catching my breath, I noticed a gray whale sprawled on the other side of this plateau. I was somewhat surprised. I had once seen whales swimming in the ocean, but as far as I knew it was unusual to come across one in the mountains. I drew closer and I saw that it was a twisted, shapeless empty hulk with soot-rimmed eye sockets. I realized it was not a beast, but a construction that bore the mark of human hands. 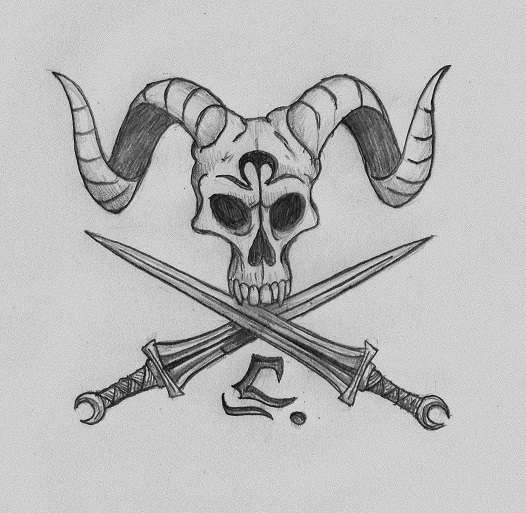 Here and there I could discern various emblems: the skull of a horned beast, an eagle grasping something or other. Also an esoteric sigil, similar to a pentagram, but with a three-pointed star inside the circle. The word ''shipwreck'' came to my mind. The illusion was reinforced by the mountain range down below; a raging ocean frozen in time. I wondered how an iron galley could even exist, and why it would end up wrecked on this dry plateau. I discovered a row of three cairns, each of them topped with an oddly shaped metal bowl. The presence of these graves meant that there must still be stranded survivors somewhere, but I never found any trace of them. I sat down on a rock and spent some time drawing pictures of this scene, all the while marvelling at the unexpected wonders that could be discovered even in such deserted places. Not too long after that I finally reached the crest and there was nowhere else to go. Unlike its barren slopes, the peak of the mountain was covered with vegetation. A round stone tower was standing in dense bushes, attended by gigantic trees. Their twisted limbs were reaching into a canopy of dark clouds above my head. I looked around and surveyed whatever might be surveyed from here. This was truly the top of the world. The air was so pure that sight carried for an infinite distance. All around me, I could see vistas from the most remote parts of the universe. On my left, at an inconceivable distance, was a ghost city. Crumbling minarets half buried in dunes of sand. Squinting, I had the impression that these dunes were not sand at all, but titanic mountains of skulls. Much closer on my right, probably less than a million leagues away, greasy shadows were dripping on a hill studded with standing stones. I caught glimpses of many other countries but refused to look further. I felt something nuzzling at my ankle and I looked down. 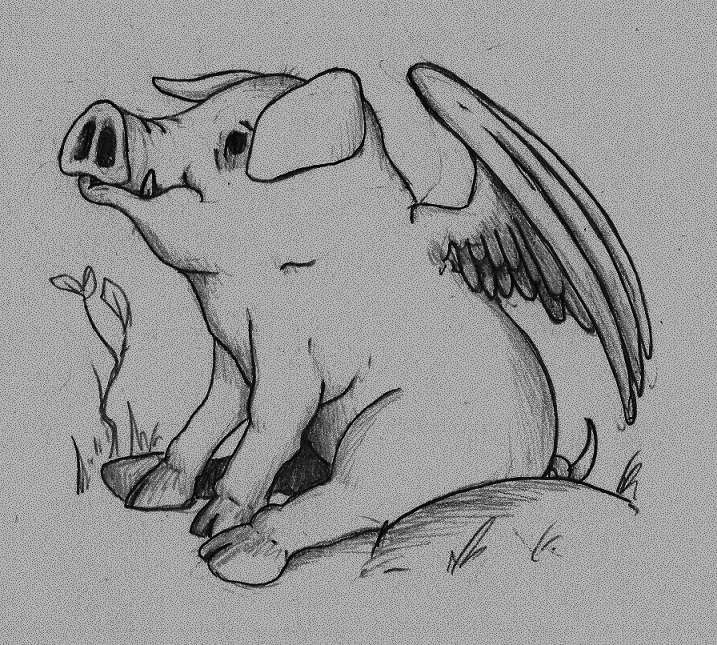 It was an adorable little pig, pink with a pair of wings. I was happy to find a friend to talk to after all this time alone. ''You are the first living creature I meet on these mountains. So… tell me, are you the dread guardian of yonder tower?'' The pig did not reply, but I heard some oinking sounds and I noticed a large wooden coop surrounded by a group of similar creatures. Suddenly, I realized that I was tingling with electricity. Even before I saw her, I was conscious of standing in the presence of something unique. A woman was walking toward me. Her hair shone with that special golden light of a sunset filtering through the clouds. She was a tall, strong and well fed woman. It was obvious that her little pigs must be very nourishing. She walked toward me and her movement filled the air like a music played by a perfectly tuned viola. Her white dress fluttered on her plump shape, so light that it seemed the wind would disperse it at any moment. I looked into her ancient eyes, gentle and soothing like a fine summer drizzle. No mortal human has eyes like those. I looked up again at the trees and understood in one instant what they were. I could picture in springtime the dewdrop sprouting slowly on the branches. Leafs of mists would unfold and expand until the branches were lost in a foliage of white fluffy clouds. Presently, it was late autumn and their foliage was heavy and black, laden with angry fruits of lightning. The brushing of the foliage boomed with thunder. Leafs began to fall one by one, then faster until I was starting to get drenched. When I looked down once again, the woman was nowhere to be seen. For lack of anything else to do, I walked to the tower. It was much smaller than I first thought and I had to crawl on all fours to get in. The interior was exiguous and windowless, the roof so low that one had no choice but to kneel or sit. Crawling vines wandered along the stone walls, trailing chains of tiny multicolored flowers. I noticed with wonder that these flowers were luminescent, perfuming the room with a gentle glow. She sat in the center and smiled at me, seeming to ask what took me so long. The stormed lasted for quite a while. Afterwards, she snuggled and burrowed her head against my shoulder. She spoke to me in her little voice, chirping softly in an unknown language that I understood nonetheless. I knew that I would remember the music of her words long after their meaning had evaporated. I gave to her my useless secrets, whatever little wisdom I had left. It was a communion where speech was simply the vessel of something divine. Windows bloomed into the wall and we could now see the cloudless night sky. Distant planets glided casually, observing us with false nonchalance. In the morning the world felt new and clean. The trees were bare but the mountain was now covered with green grass and frisky little plants. I waved at the pigs and started the long journey downward.